This project is the sleigh runners to convert the Buckboard Planter in to a sleigh. The buckboard wagon plan is sold separately. Pictured here is the buckboard wagon with wheels. The wheels would come off and be replaced with sleigh runners built from this plan. The 19 series (products that start with 19-) are full size and printed on large sheets of paper. Hardware parts and kits may be available and would listed on the paper plan for you to review once you receive it. All projects are designed for beginner skill level. Carbon paper is recommended for parts that are curved. All building instructions and painting guides provided. Measurements are in inches only. 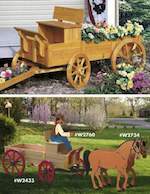 Sorry, there is no downloadable version available for the #19 series woodworking plans. This detailed desk top model measuring 11-5/8 inches long is sturdy enough for a childs toy and made up of over 66 individual parts. This project is the sleigh runners to convert the Buckboard Planter in to a sleigh.